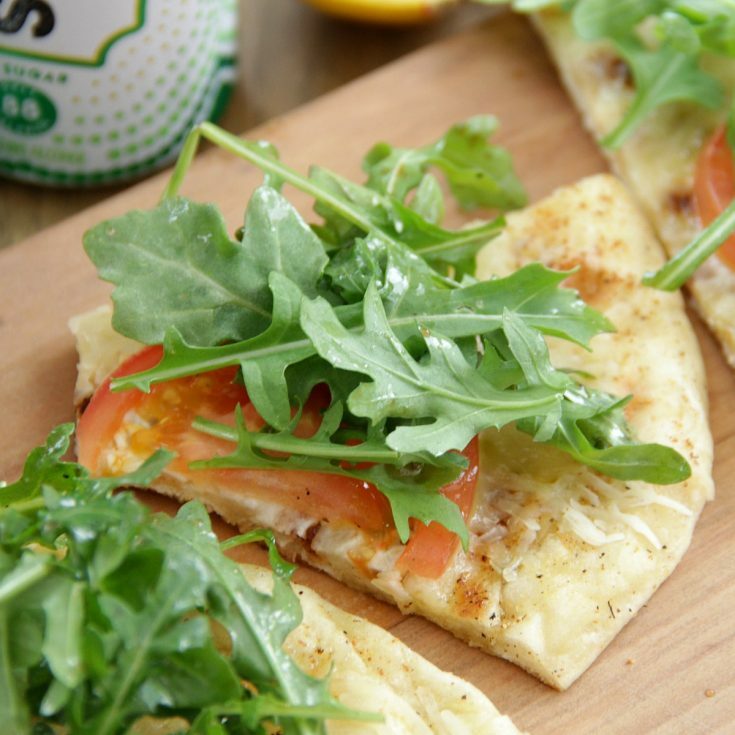 Grilled Tomato and Arugula Pizza - Eat. Drink. Love. It’s really starting to warm up outside and I’m so ready for summer BBQs and parties! I love nothing more than firing up the grill to make delicious food and sip on perfectly cool and refreshing drinks! 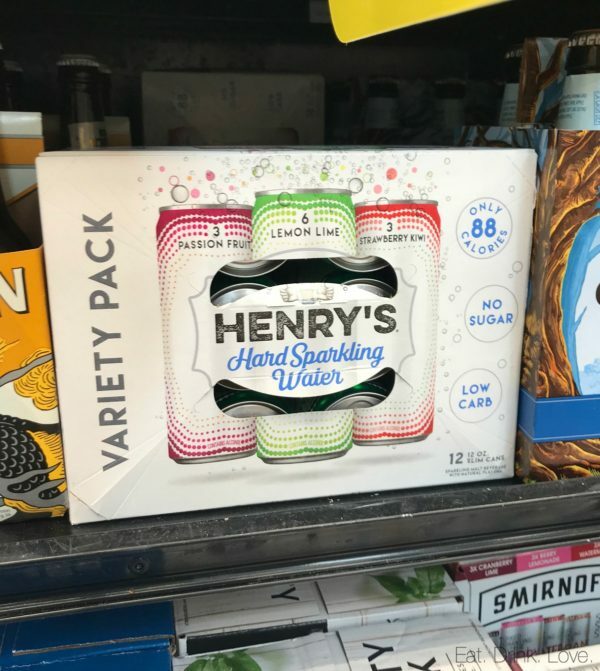 My new favorite drink for summer is going to be Henry’s Hard Sparkling Water! I’m obsessed with sparkling water and drink it every single day, so when they asked me to give these a try, I knew they’d be right up my alley! 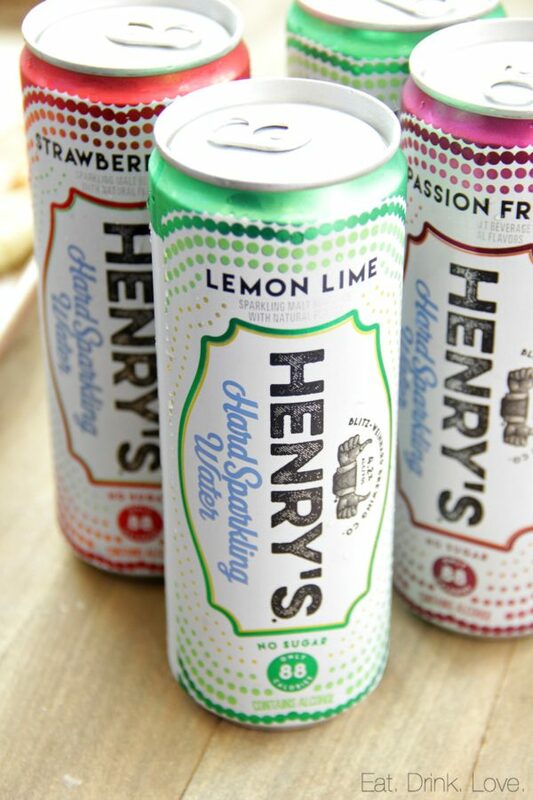 Henry’s Hard Sparkling Water comes in three flavors: Lemon Lime, Passion Fruit, and Strawberry Kiwi. I bought the variety pack so I could try one of each! They are all so refreshing and tasty! And best of all? They are only 88 calories and contain no sugar or artificial colors or flavors, which makes them a perfect low-carb alternative to beer! I gravitated towards the Lemon Lime flavor and wanted to create a fun summer recipe to make that would pair well with this flavor. 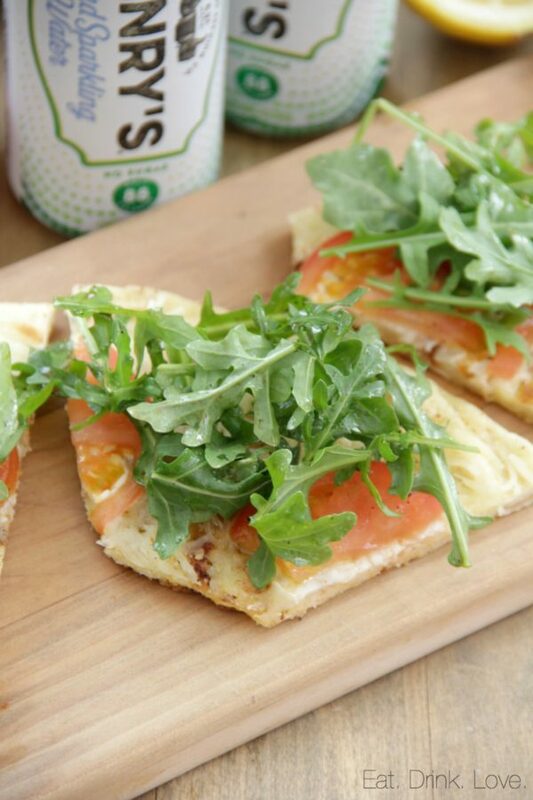 This Grilled Tomato and Arugula Pizza should be the official pizza of summer! If you have never tried grilling pizza before, you must give it a go! The crust gets so wonderfully crispy and it’s the perfect way to enjoy pizza during the warm summer months! The pizza is really quite simple. I brushed the dough with some olive oil, garlic, and salt and pepper. The toppings are just mozzarella and fresh tomatoes. My favorite part, though, is the arugula topping! I don’t know about you guys, but I always have to have a ton of salad to eat alongside my pizza. 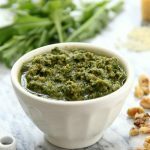 I just love dipping my pizza crust into the dressing and spooning my salad on top of it, so why not just pile on the arugula to begin with?! 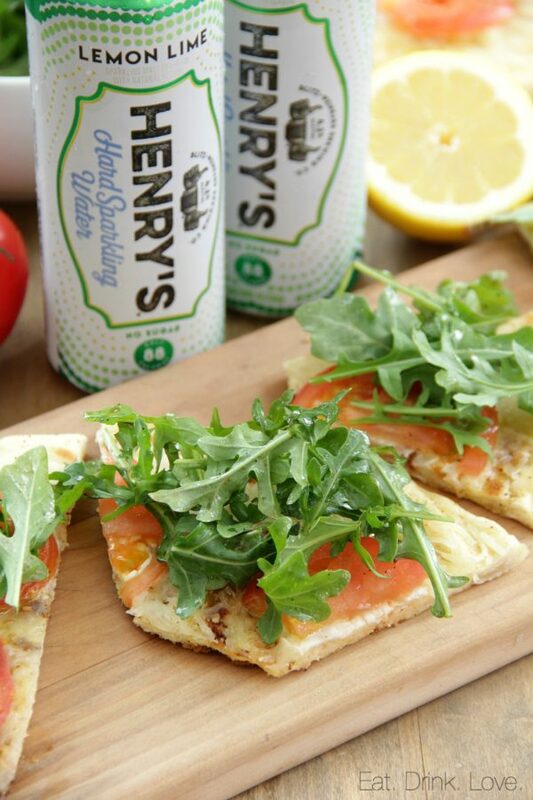 The arugula is tossed in a light and lemony dressing that pairs perfectly with the Lemon Lime Henry’s Hard Sparkling Water! This grilled pizza would be the perfect light lunch with friends or you can also serve it as an appetizer! Summer, I’m ready for you! 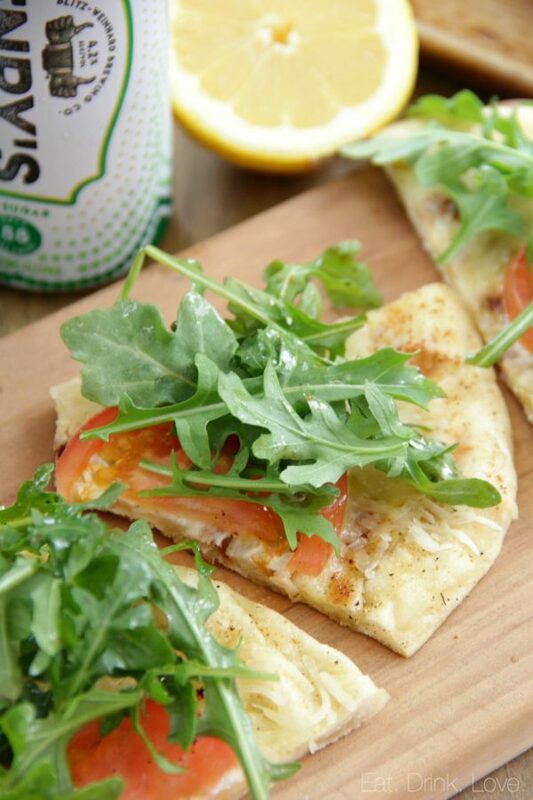 This easy flatbread recipe uses premade dough, fresh tomato and arugula and is cooked right on the grill! Sprinkle flour on a flat and clean surface. 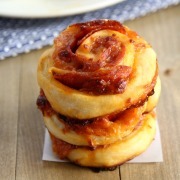 Roll the pizza dough out to about 1/3-inch thickness (you can use more flour if needed). Preheat grill or grill pan over medium heat. Spray with cooking (non-stick) spray. Brush 1 tablespoon of the olive oil onto one side of the dough and sprinkle with salt and pepper. Place the oiled side of the dough down onto the grill or grill pan. Let cook for about 3 minutes until lightly golden (this may take longer on a grill pan). Remove from the grill. Flip the dough over carefully and brush the other side with the remaining olive oil (note: If using a grill pan, you can leave the dough on the grill pan when completing this step). Spread the garlic evenly over the pizza and season with a little bit more salt and pepper. Sprinkle the cheese and then arrange the tomato slices. Return the dough to the grill (toppings side-up) and cook for another 3 minutes until the dough is golden on the bottom and the cheese is melted. Remove from the grill or pan and let stand for 2-3 minutes before slicing. For the topping, add the arugula to a mixing bowl. In a smaller bowl, whisk together the lemon juice, olive oil, honey, garlic powder, and salt and pepper. Toss the dressing with the arugula until well-mixed. 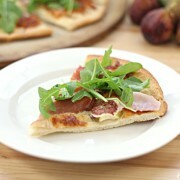 Spoon about 1/4 cup of the arugula on top of each slice of pizza. Finish with a drizzle of balsamic vinegar if desired. Serve.